Essential oils are the volatile liquids extracted from plants, flowers and trees. These oils, which are not actually oils, but rather watery fluids, contain a large variety of chemicals, from aldehydes to terpenes. These chemicals have the ability to disinfect, sedate, alleviate pain and stimulate immune function as well as hormone production and circulation. Essential oils that increase blood flow are often called tonic. Coriander essential oil (Coriandrum sativum) is extracted from crushed seeds of the annual coriander herb. It is a clear, sweet, woody liquid made up of linalol, decylaldehyde, borneol, geraniol, carvone, anethole and other chemicals. According to Julia Lawless, author of "The Illustrated Encyclopedia of Essential Oils," coriander is a circulatory, cardiac and nervous system stimulant. While coriander can be inhaled, according to The Ananda Apothecary, it can also be applied to the skin by blending the oil with a carrier oil. Small doses can be ingested, but according to Lawless, larger doses can be stupefying. 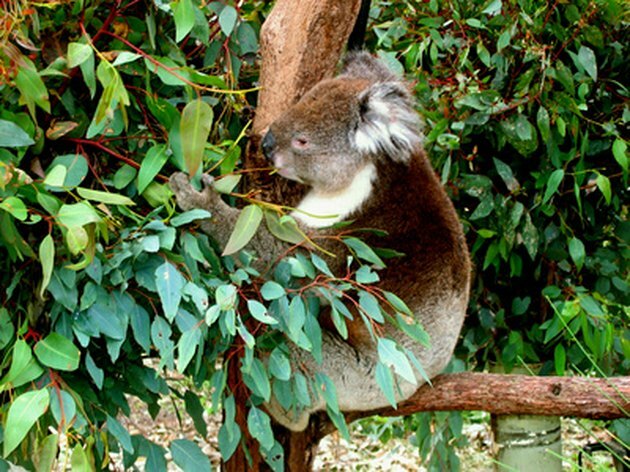 Eucalyptus essential oil is extracted from the leaves and twigs of several types of eucalyptus trees. Eucalyptus globulus comes from the blue gum eucalyptus, which is native to Australia and Tasmania, although most of the oils are cultivated in Spain, Portugal, Brazil, California, Russia and China. Its main constituents include cineol, pinene, limonene, and other chemicals. Lawless says that blue gum eucalyptus is the most beneficial of the eucalyptus oils for poor circulation. It has a harsh, camphoraceous odor that can be softened with the addition of lavender or lemon. The combination of oils can be blended into a carrier oil for use as a massage oil. Lawless says that eucalyptus oil should not be taken internally as even very small doses have been reported to be fatal. Many species of cypress trees produce cypress essential oil, but according to Lawless, Cupressus sempervirens is considered superior for its therapeutic benefits. This pale yellow to greenish-olive liquid with a smoky, sweet-balsamic aroma is cultivated from trees grown in France, Spain and Morocco, but they are native to the eastern Mediterranean and now grow wild in France, Italy, Corsica, Sardinia and other regions. Both Lawless and Valerie Gennari Cooksley, author of "Aromatherapy: A Lifetime Guide To Healing With Essential Oils" agree that cypress essential oil benefits people with poor circulation. Cooksley suggests diffusing into the air a blend of 3 parts cypress essential oil, 3 parts lemon essential oil, 2 parts bergamot essential oil, 1 part ginger essential oil and 1 part geranium essential oil. She also recommends mixing 4 drops cypress, 3 drops grapefruit essential oil and 1 drop nutmeg essential oil with some bath salt or oil and adding them to a tub of warm water for a bath that can help improve circulation. Other essential oils that can alleviate poor circulation include ginger, black pepper, rosemary and Spanish sage.